This is a little gem of a beach just beyond Ai. Ioannis. 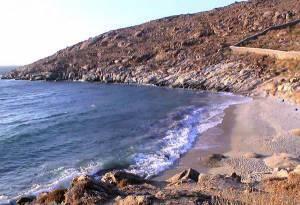 It is a perfect spot for beach lovers who are looking to escape the organization of the larger beaches. Here you have a postage-stamp size of beach, hidden and surrounded by rocks, and without lounges, umbrellas, tavernas or cafes. You need to bring your own food and drink, and the beach can be accessed on foot or with a motorbike, but only up to a point. Then you have to climb down the twenty-meter (70 foot) rocky pathway.